Overview: While looking through a coffee can full of watches at a local antique store, I pulled out this little gem. 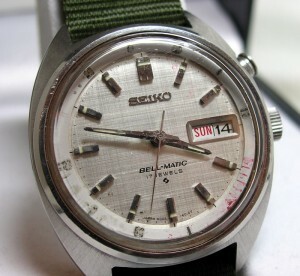 First I saw the back, so I knew it was a Seiko, then I flipped it over and saw some magic words, Bell-Matic. What is a Bell-Matic? In the late sixties to mid seventies, Seiko created the first automatic alarm watch. It was in really rough shape. The crystal was badly scratched, and even worse, th dial was no longer attached to the main plate! However, with a few gentle shakes, the second hand started instantly, so the movement itself was just fine. I asked, he said $5. I knew it was worth more than that, so I was sold. Case: 37mm diameter, stainless steel, ‘waterproof’, 19mm lugs. Back: Stainless, screw down, marked SEIKO Stainless Steel 4006 – 6010 Waterproof, Japan. Movement: Automatic, 4006A, Seiko in-house design, 17 Jewels. Base movement is automatic only, alarm is hand wound. Complications: Day of week, Date, mechanical alarm. Other: Luminous hands and markers, Lumibrite, rotating chapter ring. The watch is a fairly modern sized watch 37mm, and fairly thick at 13mm. The case has a slight cushion effect, making it look larger than it is. The hands are sword style, and very handsome, and a first for my collection. The dial is a silver cloth weave pattern. The markers are applied bright silver with luminous material, possibly rhodium plated. The crown is unsigned, but over-sized and easy to use. The reason behind this is obvious, it is how you adjust the alarm. How you set the alarm is simple. Pull the crown out to the first position and rotate counter clockwise until the red marker is pointing towards the time you want it to go off. Press the crown in, wind, then pull the button at 2 O’clock. When the hour hand points to the time, a little bell rings, much like an old fashioned alarm clock. To repair this watch, I had to go much beyond just polishing the crystal and removing the DNA of ages. I had to completely remove the movement, remove the hands, reattach the dial, and put everything back in place. On top of that, I had to use the big guns and use a polishing wheel to fix the crystal as well. Hand polishing just didn’t cut it. In doing all this work, I am really impressed with the quality of Seiko movements of the early 70′s. Everything was very well put together (other than the dial feet) and had the feel of a fine timepiece. I did a little research, and this watch retailed for $105 in 1970! Not a cheap watch in any way. Overall, I am very happy with this watch. It has a few small issues, like a worn chapter ring and ding in the edge of the crystal, but the wear gives it some character. I know if I wanted to flip it, I would make my money back 10 to 20 fold. The alarm works very well, and I find I am using this watch more than my Omega Speedmaster. An alarm is handier than a chronograph.